Last month, I wrote about the first part of the exhibition The Layton Art Collection: 1888-2013. I introduced the great Milwaukee businessman and art patron Frederick Layton, and touched upon the founding of the Layton Art Gallery. The first section ends with the death of Frederick Layton. The second section, which is my favorite part in the exhibit, starts with Charlotte Partridge. Charlotte Partridge, born in Minneapolis in 1881, was an incredibly progressive woman. She attended Dana Hall in Massachusetts and then the Northern Illinois Teacher’s College in DeKalb, Illinois. After traveling through Europe, Partridge enrolled at the Church School of Art in Chicago, where she also taught after graduating. In 1914, she began teaching at the Milwaukee-Downer College, but by 1920 she was dissatisfied with the school. By this point Miss Church (of the Church School of Art) had closed her art school and offered all of her furniture and supplies to Partridge. Partridge thus decided to open an art school in the basement of the Layton Art Gallery. From its inception in 1920, the Layton School of Art, administered by Partridge and her life partner Miriam Frink, was different from other art schools in the area. Its primary aim was to train young men and women to earn their living as artists. In order to achieve this goal, students were required to take a variety of classes including psychology, drama, music, and poetry, all of which Partridge and Frink believed encouraged students to better understand art. In addition, students attended co-educational life study classes held with live models. This practice, although common in today’s art schools, was considered revolutionary in the early 20th century. Meanwhile, George Raab, a well-known Milwaukee artist, was curator of the Layton Art Gallery. Raab was only the second curator at the gallery and accompanied Frederick Layton on many art buying trips. Although he was personally interested in local art and had advocated for a re-hanging of the collection, Raab continued Layton’s legacy by maintaining the gallery’s Victorian aesthetic. Because of this, attendance at the gallery had stagnated under Raab’s leadership. It was thus no surprise (except to Raab) when in June 17, 1922, while Raab was on vacation, Milwaukee newspapers announced that the Layton trustees had asked for Raab’s resignation. Charlotte Partridge, seen as the key to modernizing the Layton Art Gallery, was promoted to curator. Partridge immediately did away with the dark maroon wall color, painting them a light tan instead. She hung artworks at eye-level, instead of salon-style. Partridge also dispersed most of the Victorian paintings in the collection, lending them to institutions around town, and filled the gallery space entirely with local contemporary artists. She even installed electric lighting. The Layton Art Gallery became a vibrant place full of activity. This comment certainly did not help public opinion as citizens defended Milwaukee’s honor. Despite that, the exhibition opened and drew twelve hundred visitors in just three days. The drama wasn’t over, though. Wright was arrested the day that he was scheduled to lecture over an issue concerning his deceased wife’s estate. He was released just in time to have dinner with Partridge, Frink, and some supporters before giving his lecture. The next day Wright asked Partridge to pay him immediately; she did, and a few minutes later, the police showed up at Partridge’s door to withhold Wright’s wages. She gleefully responded that she didn’t owe Wright any money. Richard H. Jansen (American, 1910–1988), East Side Street in Winter, n.d. Gouache on paper. Milwaukee Art Museum, Layton Art Collection, Gift of Layton Art League. As evidenced in this short story and in the founding of the Layton School of Art, Partridge was a strong-willed, forward thinking modernist. She was also socially progressive. Partridge was the director of the Federal Arts Project in Wisconsin, the visual arts arm of the Works Progress Administration (WPA). Gerritt Sinclair, the first professor hired at the Layton School of Art, and Richard Jansen were both WPA success stories. 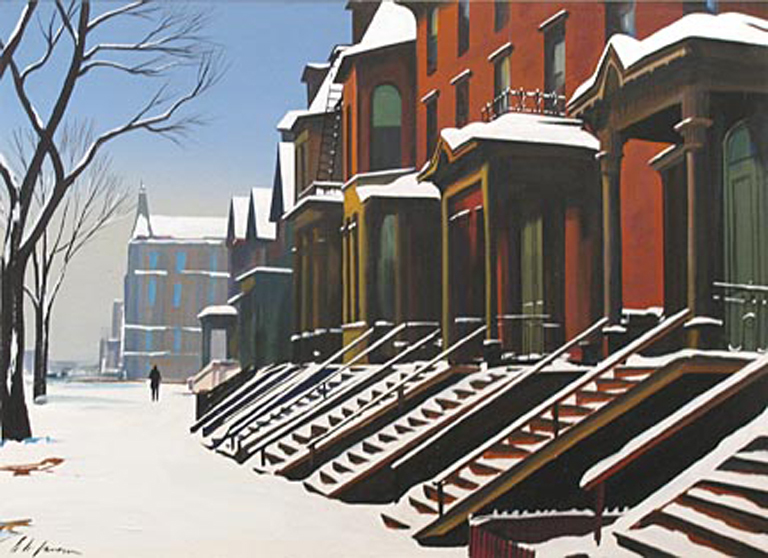 Jansen’s East Side Street in Winter, above, created as part of the Federal Arts Project, is part of the Layton Art Collection and is currently on view in the Lower Level. Charlotte Partridge made a major impact in Milwaukee through both the Layton School of Art and the Layton Art Gallery, as well as involvement in building the War Memorial. She remained a Layton Trustee until 1973. Partridge seems like an amazing person, one that I wish I had had the opportunity to meet. Stay tuned for the Layton Art Collection: 1888-2013, Part 3! This entry was posted in Art, Behind the Scenes, Curatorial, Exhibitions and tagged Charlotte Patridge, Chipstone Foundation, Layton Art Collection, Milwaukee, Milwaukee history. Bookmark the permalink.